What a fun cap! Want one? Just donate at 1 of our 4 donor centers in March 2019 and you’ll get this fun CBCO ball cap as a “Thank you.” It’s navy blue with CBCO’s logo on the front, and a velcro closure in the back. Great for gentlemen or ladies to show the world you care about patients in need at more than 40 local hospitals that receive all of their blood and blood products from CBCO. Be sure to take a selfie in your new cap and then share it online. We’re @OzarksBlood on Facebook, Twitter, and Instagram, so tag us and use our hashtag — #RedCellfie — so we’ll see you! 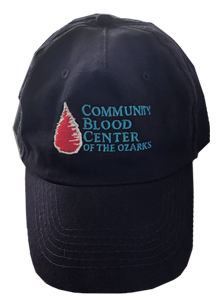 This CBCO Ball Cap is available in March 2019 when you donate blood only at 1 of 4 CBCO donor centers in Springfield, Missouri, Joplin, Missouri, Bentonville, Arkansas, or Springdale, Arkansas.